FPS Russia would eat this, I think. This recipe really brings me back to my early years at Berkeley. I was really excited to be on my own, and I had a lot of room to try something on my own. My friend Bo and I wanted Beef Stroganoff, so using what I had in the pantry, I made something like it. 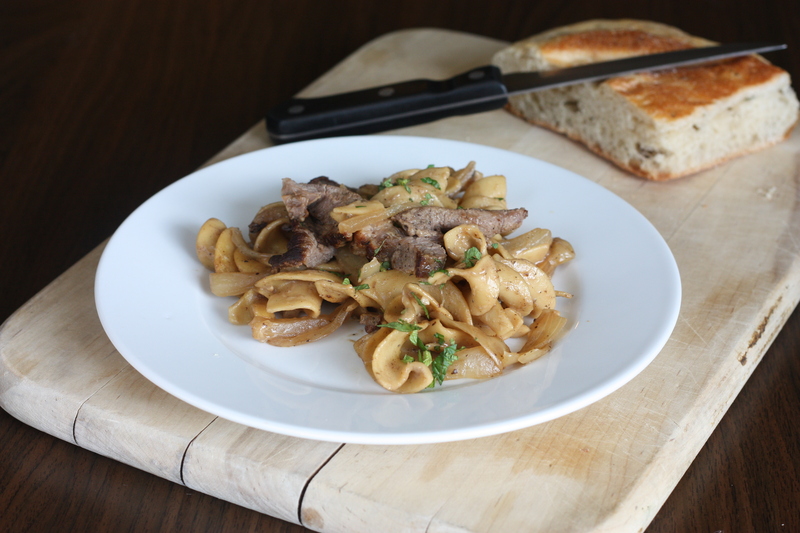 It’s by no means traditional stroganoff, but it’s pretty damn good. This Stroganoff is basically a cream sauce with egg pasta. For my version, you will need onions, mushrooms, any stock, cream of mushroom, sour cream, parsley, mustard, garlic and beef. I usually use a tough cut of meat so I can stew it until it’s fork tender. But I had some thin cut steaks so I just used that. Boil egg noodles in salted water until el dente. I seasoned the steaks with garlic powder, mustard powder, salt peppers, and cooked them super fast on a really hot pan with olive oil. It literally cooked in 2 minutes. Remove the steaks and then throw in mushrooms and onions. Cook them down for about 2 minutes and then add 1 clove of garlic. Deglaze with some stock (I used beef stock), and reduce. Add in the cream of mushroom and bring to a simmer. At this point you can decide how thick you want the sauce to be by adjusting with the pasta water. I prefer a thicker sauce. Add the pasta in now. Then take off the heat and season with sour cream and mustard to taste. Add finely chopped parsley and top with cuts of that beautiful steak. Not traditional but great nonetheless. This entry was posted on February 16, 2012 by rrfoods in Dinner, Pasta and tagged beef, russian, stroganoff.